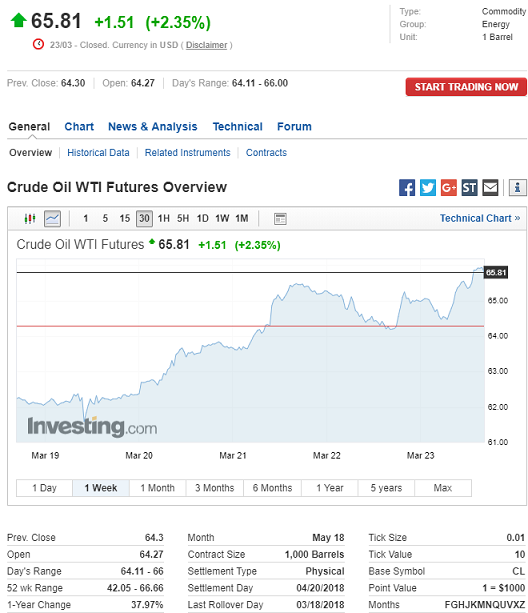 West Texas Intermediate (WTI) has surged over 5% since the close on Monday, and is up 5.5% on the week, closing the week out at $65.81 per bbl, the highest levels seen since crude touched over $66.00 per barrel on January 28th 2018. The million dollar question for direct participation investors is; are these prices here to stay, and is now the right time to deploy capital into drilling projects? There are two essential reasons why the price improvement of oil is taking place. American extraction came in much lower than expected for the week. 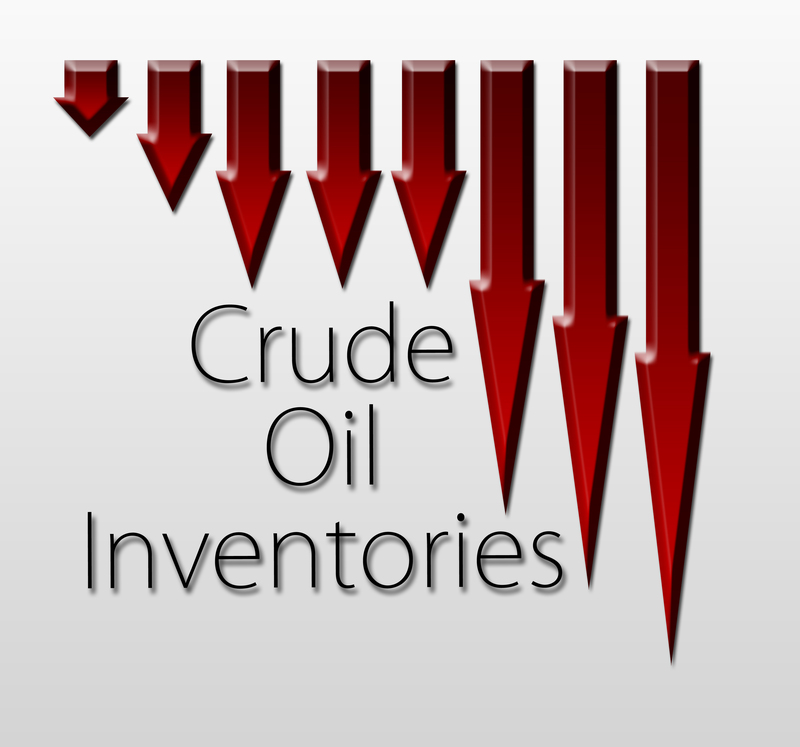 Estimates from the Energy Information Administration (EIA) showed a decline of 2.6 million barrels of US crude stock. However analysts had expected a 2.5 million increase, a different of 5.1 million barrels of oil. Geopolitics can often be used to explain all manner of events in the energy sector, especially market moves that make less “fundamental” sense. 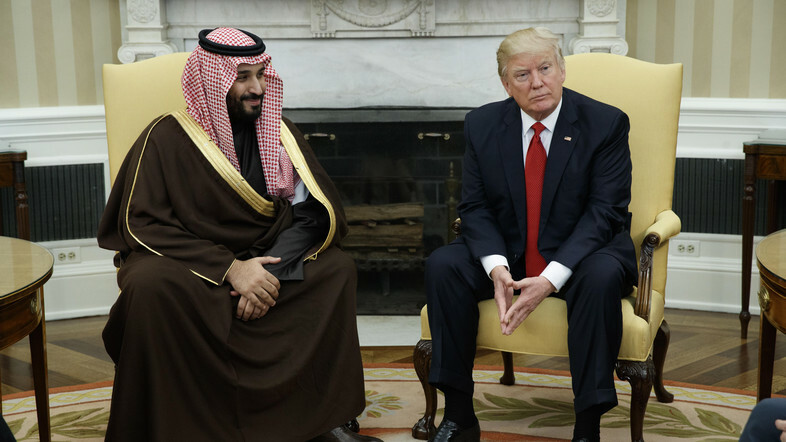 President Donald Trump meets with Saudi Defense Minister and Deputy Crown Prince Mohammed bin Salman bin Abdulaziz Al Saud in the Oval Office of the White House in Washington, Tuesday, March 14, 2017. Uncertainty resulting from cross-border and global unrest is an ongoing staple element to the oil markets. The main influence Geopolitics has on the futures market is how one regards the potential future oil availability, but until the oil flow is actually impacted, its pressure is more apparent than real. Global demand for crude oil remains one of the most misunderstood yardsticks to measure the future price of oil. Economics 101- yes the balance between supply and demand certainly does influence price, but the REAL importance is the effect projected demand has on the amount of EXCESS supply. Too much excess volume will prompt prices lower, while the opposite will drive prices higher. When we speak of “market balance,” it always assumes the availability of excess volume beyond immediate requirements. That balance that the oil markets and investors alike have sought since the price of oil came tumbling down in 4Q 2014 is rapidly emerging and, in some regions may have already arrived. It appears that the accordion effect of slashed CAPEX drilling/exploration budgets of major IOC’s and large private equity backed Independents, as many analysts predicted it would, is finally showing itself as the supply/demand discrepancies narrow. Currency exchange rates speak about the foreign exchange rate for the dollar. Thanks to a little secret Nixon era agreement made between the United States and Saudi Arabia as a countermeasure to sustain “artificial” global demand for the US Dollar in wake of the crumbling Bretton Woods international monetary system, the vast majority of all international oil trade is denominated in US Dollars. (We can talk more about the Petro-Dollar and the influence on American history and foreign policy at a later time) When the value of the declines against other currencies, especially the EURO, the dollar value of a barrel of oil increases. This relationship makes owning interests at the wellhead one of the king of cash flowing hedges against US inflation. Recently, the weakening dollar has resulted in that upward pressure on crude. The common theme throughout all of this is how the forward price of oil is perceived by the trader. Traders will peg the price in a future contract to the expected cost of the next available barrel of crude. Options and other derivatives are then applied as insurance against movements in either direction. In effect, the perceived direction of prices becomes the driving engine in traders’ actions. Keeping this in mind, therefore, the most direct way of concluding which way the market will move is pretty straightforward. It involves the number of short versus long contracts being exercised. Until last week, short contracts held considerable sway. That changed abruptly on Thursday with long contracts taking over, making LONGS the new market driver. Another consequence of this transition is the need for holders of short contracts to liquidate positions, requiring they go back into the market and purchase contracts. 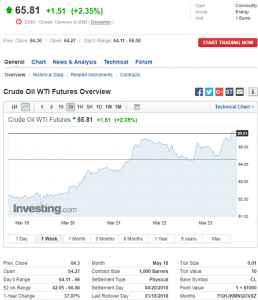 This serves as another upward pressure on prices. At some point all of this evens out and sets a new market equilibrium. After all, balance is what trading markets always seek. You put all of this together and it bodes quite well for investment returns in this sector. 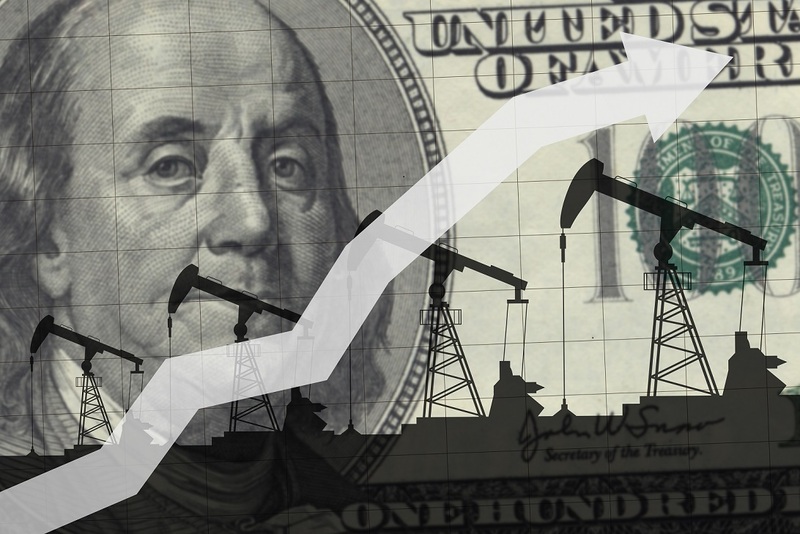 It’s time for direct participation investors to shake off fears developed from the 2014 US Shale Oil over-saturation, and put capital back into American oil drilling action for strong returns. This entry was posted in Weekly Oil Market Recap and tagged Bullish on Crude Oil, Long on Oil, Oil Prices, Trump meets Saudi Prince on March 24, 2018 by Derek Evans. 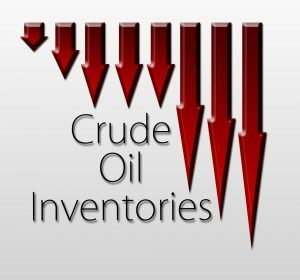 The information provided in and on this website is for informational purposes only and provides factual business information about Veteran Oil Partners, LLC. This information provided in and on this website is not intended to and does not constitute an offer to sell or the solicitation of an offer to purchase to any person in any jurisdiction. The contents of this website shall not be construed as legal, business or tax advice.